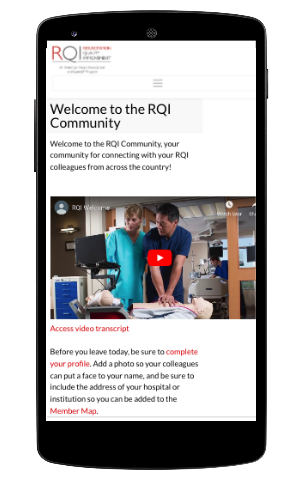 The Resuscitation Quality Improvement Program had an online community that wasn’t being used. The community had a good raison d’être—to enable collaboration and networking among isolated administrators of a specific hospital training program—but a lack of strategy at launch had left it a ghost town 18 months later. We launched a refresh and revitalization effort that included four parts: a light design refresh, a point-of-use video series, a welcome page, and an email drip campaign to reengage members. The goal of the welcome page was to motivate members to return to and participate in the community by highlighting its main value points. We wanted members to feel excited that the organization had rededicated itself to developing and supporting the community. We linked to the welcome page in each reengagement email. Members began to utilize the community to discuss their work. Over the four months following the beginning of the reengagement campaign and launch of the welcome page, community forum activity increased 500%. Qualitatively, we saw detailed, on-topic posts and multiple replies. Over those four months, the welcome page had a bounce rate of only 4.17%.